Forgive me readers, I’ve been remiss. It’s very easy to set up a blog and just as easy to let it slide. Of this, I am guilty. The hand is better; physioterrorism seems to have helped. They gave me a fantastic state-of-the-art kit … a large elastic band and a peg! I can’t complain as it seems to be doing the trick. Anyway I digress, I’ve done my confession, now it’s on to the brownie! Over the past couple of weeks, I’ve been going nuts about baking brownies! Not content with using ordinary flour, I’ve played around with hemp and coconut. Hemp flour is a fabulously green powder that does have a very distinct flavour and texture. I used all hemp in one batch of brownies, but in hindsight, I should have used a third hemp, the other two-thirds of GF flour. Coconut flour I found in a Spar in Leamington Spa. It was an amazing shop, full of Asian and Middle Eastern goodies. That evening we had coconut brownie with chocolate sauce (think bounty but without the sickly sweetness or bits to get stuck in your teeth); hit every single note for all concerned. 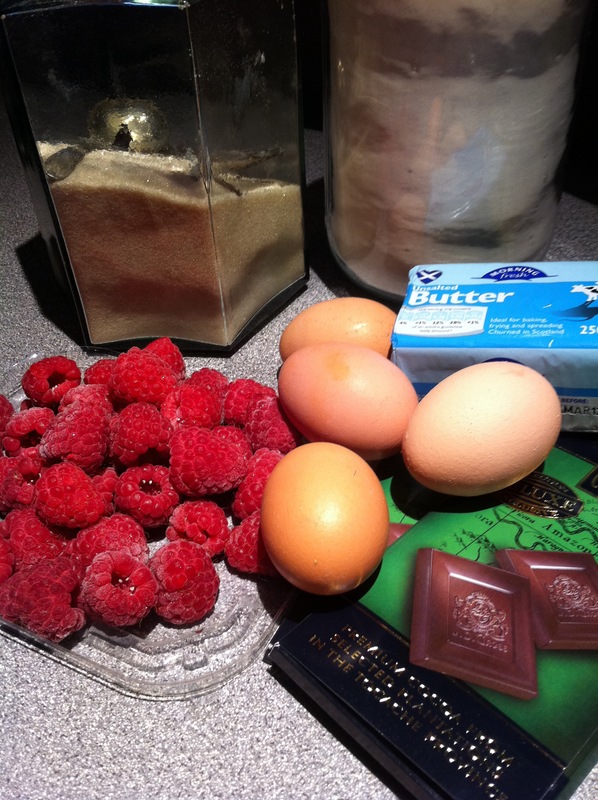 At Edinburgh Farmers’ Market last Saturday, there were frozen raspberries from Perth; hence this recipe. 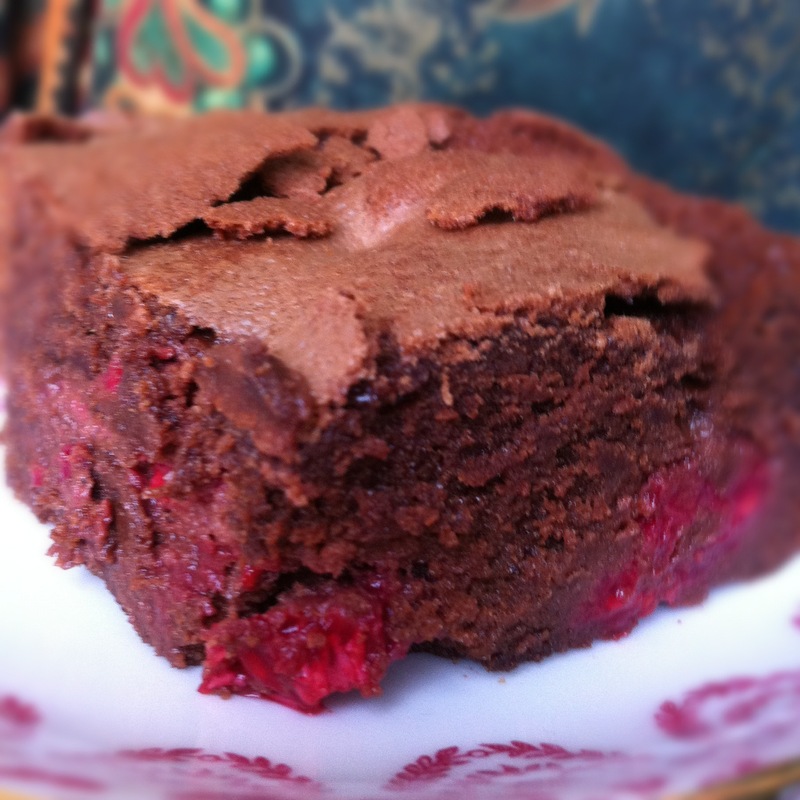 Brownies are so easy and quick to make; incredibly versatile and well-behaved using all manner of different ingredients. Try throwing chunks of white chocolate in the batter or nuts, frozen cherries, dried sour cherries, dried cranberries, fresh blueberries – whatever tickles you taste buds, just lob it in. If it doesn’t work, then douse in booze and serve with custard. This recipe is easy to adapt to suit coeliacs and dairy intolerant folk just by replacing the ingredients that disagree with you. Amazing what a few ingredients can make! Preheat oven to 180C/160C fan/Gas 4. Line a 9-inch square tin with baking parchment and put to one side. Break chocolate into smallish pieces (while it’s still in the wrapper, I wallop it on the work surface to smash it up). Cut butter into small cubes and put into a bowl along with the chocolate. Pop over a pan of simmering water, but don’t let the bottom of the bowl touch the water. Stir occasionally until it has melted into a glossy mess. Leave to cool slightly. In a separate bowl beat the eggs and sugar until it is a thick creamy mass and when the beaters are lifted, there is a ribbon trail. I know most recipes say fold in the chocolate, but I’ve found that pouring the molten goo into the eggs while the mixer is going at full tilt doesn’t do any harm. 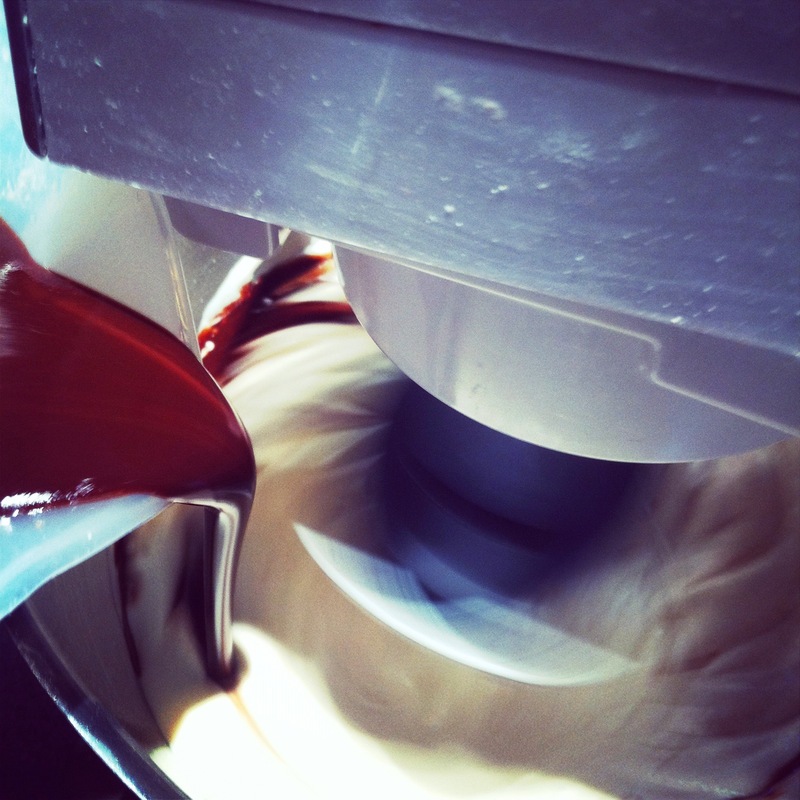 So gently pour the chocolate into the fluffy egg mix with the mixer going at hyper-drive. 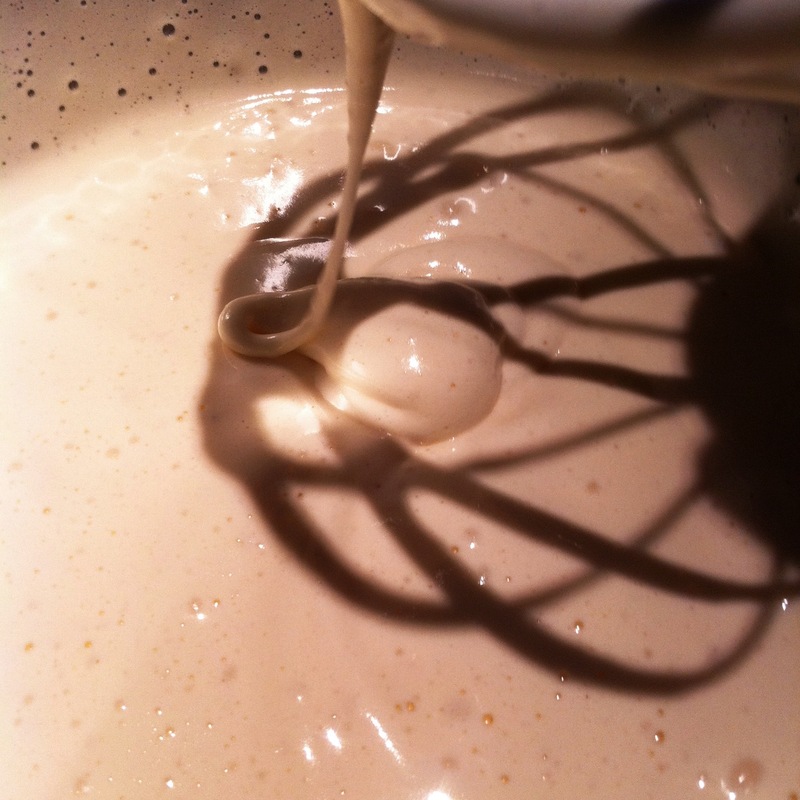 Sift the flour over the mix and gently fold in, making sure that there is no flour left at the bottom of the bowl. 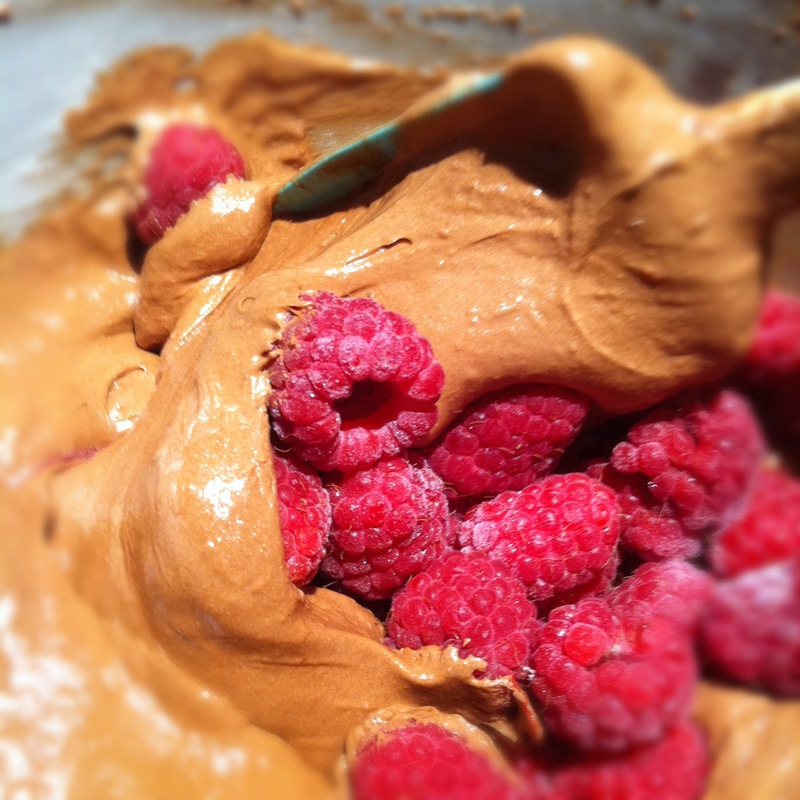 Once incorporated, fold in the raspberries; it doesn’t matter if they are still frozen or not. Plop the whole lot into the tin and throw in the oven on the middle shelf. Set timer for 25 mins and check when it pings to see if it the brownie has set. It shouldn’t be firm but if a little soft put back for another 3-5 minutes. When cooked, leave to cool in the tin. Don’t worry if it’s a bit gooey, it’ll taste fab anyway. The longer you leave it the firmer it will be. The crust may sink and fracture, that’s fine. If you’re serving it warm have it with a crackingly good vanilla ice cream or clotted cream. Makes 9 very large squares for greedy-guts or cut into 12 for a more dignified portion. Previous Previous post: Give Us Our Daily Bread! Next Next post: Lavender’s Blue, Dilly, Dilly! How to Bake Responsibly with Lavender!